Babe Ruth's gold pocket watch sold for $650,000 at auction -- less than was expected. The Babe didn't hit this one out of the park. 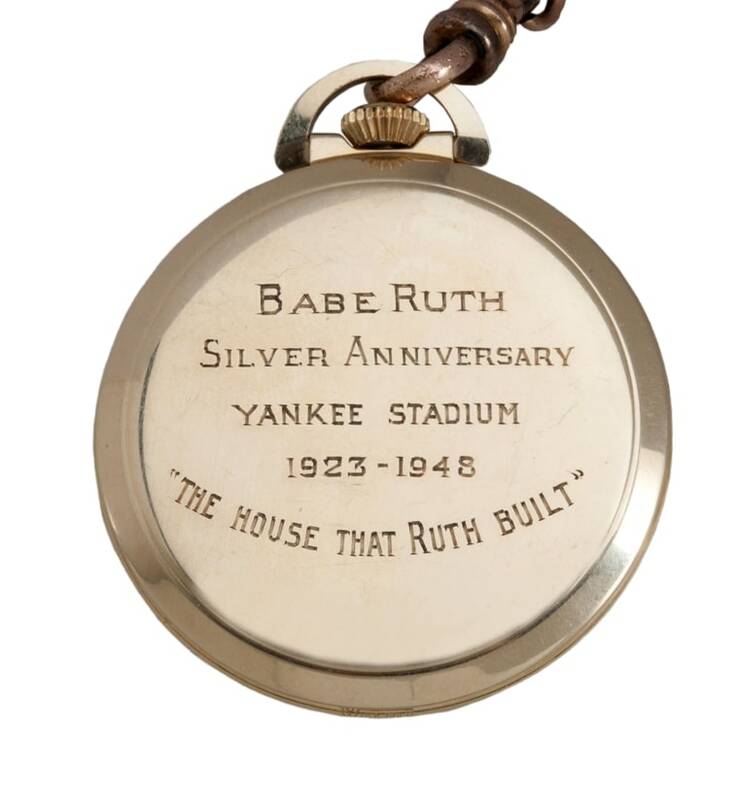 The gold pocket watch George Herman "Babe" Ruth was given at the 25th anniversary of Yankee Stadium in 1948 -- his last appearance there before his death -- sold at auction for $650,000 - about $100,000 less than had been expected. The 14-karat pocket watch is the only significant Ruth artifact ever offered directly to the public by the Ruth family. Dan Imler, vice-president of SCP Auctions, which conducted the online auction www.scpauctions.com., told NBCNews.com last week he expected the watch to fetch upwards of $750,000. But when the hammer came down after a week of online bidding on Sunday, the winning bid was $650,108. Imler noted the price was still one of the highest prices ever paid for a piece of sports-related jewelry and a top-10 price for a Ruth artifact. “Once again, Babe Ruth carried the day. As was his custom, the Sultan of Swat continues to break records,” he said. In total, the SCP auction of more than 1,000 sports memorabilia items brought in $4.5 million. Other top lots included a 1965 Sandy Koufax autographed L.A. Dodgers game-worn home jersey that sold for $268,664 and a winning bid of $259,642 for Satchel Paige's 1971 National Baseball Hall of Fame Induction Ring. The buyers' identities were not released by SCP Auctions. - Steve James, NBCNews.com contributor.